If that is your problem, then be sure to take note of the brand names mentioned on this list. Boon. Many big name fighters use boon shorts for a reason and it’s because they’re durable. Buy a pair and you’re sure to have invested your money well in a pair of shorts that’s going to last. Lumpinee. Opting for fancy and stylish designs, many novices opt for Lumpinee shorts simply because they look good. But, they’re not just all eye-candy. 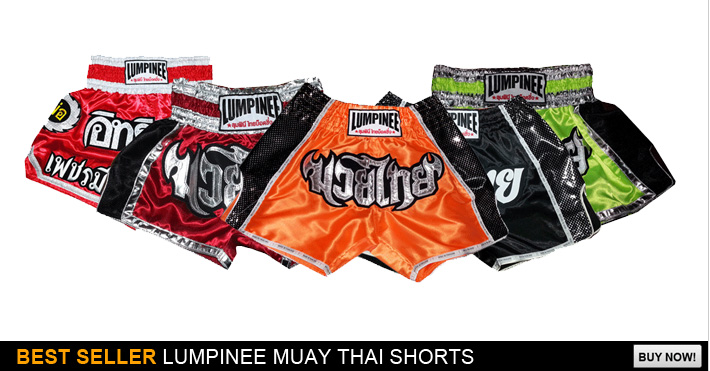 Lumpinee shorts are also quite durable and are one of the most popular brands in Thailand. Top King. Providing wider leg room than usual, many Muay Thai fighters prefer to use Top King shorts for training. Though, there are also plenty of amateur fighters who use them for the very same reason. Raja. These shorts are made of 100% satin materials and as such, are very light and comfortable to use. They’re not exactly as known of a brand as the others mentioned on this list, but they’re more than worth your money. Twins. Famous in western countries, Twin shorts are made of 100% polyester Satin and are also quite popular in Thailand. Fairtex. The most expensive of the brands mentioned on this list, Fairtex shorts are designed to give you better mobility and ease of movement. They’re also considered a premium brand of shorts and are hand-made, much like other Thai brands. Windy. A maker of Muay Thai shorts since the 1950s, Windy is a reputable brand whose shorts are worth investing in. If you’re ever in the market for Muay Thai shorts, you can never get wrong with these brands. They’re all built well and should last you for as long as you want them. Though, just make sure that you choose not based on brand, but based on their comfort and fit as those are the two most important things when it comes to Muay Thai shorts. Speaking of Muay Thai shorts, be sure to check out http://www.muaythaisport.com and their wide range of Muay Thai equipments and accessories such as boxing gloves, MMA shorts, Muay Thai shorts and so on and so forth.